or, you don’t have to spend a fortune to produce a work of art. What is remarkable about this photo? Is it the composition? Is it the quality of the print? Is it the extraordinary subject matter? The excellence of the digital manipulation? – apparently a factory was removed, as was a man with his dog. Well, it may be all of these and more but what is most remarkable is the price tag – this is the most expensive photographic print ever sold. 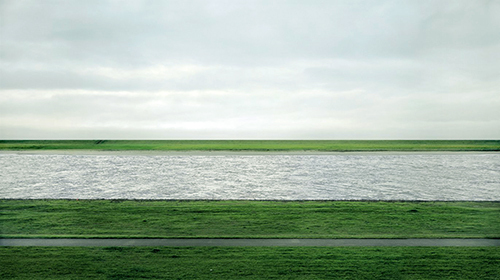 It is “Rhein II” taken by German artist Andreas Gursky in 1999. 190x360cm mounted in plexiglass (which is admittedly quite expensive at about $100 per sq metre) and was sold at Christie’s New York a bit over a month ago in November 2011 for $4,338,500.00 or $415,604,943 per sq cm – quite a lot given that we are told we’re on the eve of a world depression. Perhaps the artist himself managed to talk the price up thus, “It’s my favourite image. It says a lot using the most minimal means … for me it is an allegorical picture about the meaning of life and how things are.” So now you know. A Christie’s spokesman said, ” the viewer was not invited to consider a specific place along the river, but rather an almost ‘platonic’ ideal of the body of water as it navigates the landscape”. How anyone can come out with a statement like that with a straight face is beyond me, perhaps he was thinking of his commission. Gursky used a 4×5 view camera and sheet film. Now whatever you may think of his work of art this was not an expensive image to produce, you can pick up a view camera and a lens or two with darkslides etc on eBay for about €1,000. The second picture doesn’t even have a title unless you consider ‘Untitled 96’ a title. It was probably taken with an Instamatic or similar in 1981 by Cindy Sherman. She herself is the model. It sold for $3.89 million in 2006. In 2010 her ‘Untitled #153’ sold for a rather measly $2.7million – still times are hard and no doubt things will pick up. 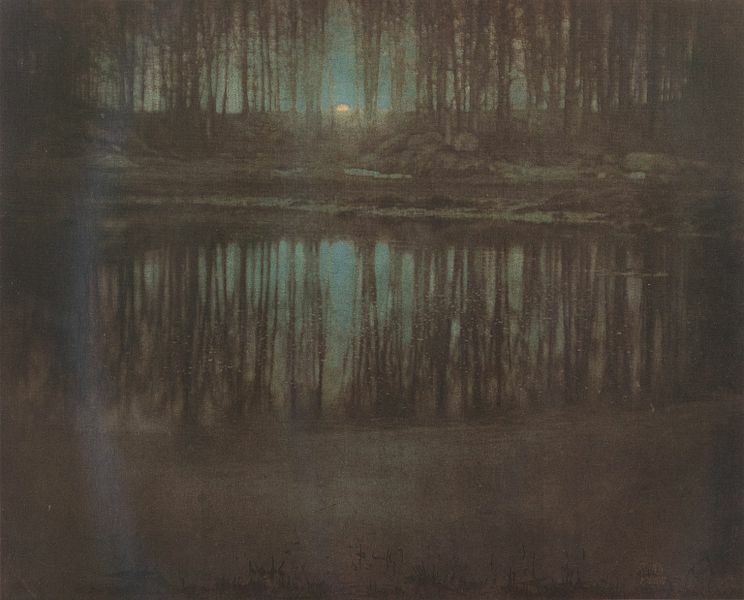 The third photo by Edward Steichen, one of only three gum bichromate prints none of which are exactly the same, was taken with a simple plate camera in 1904. It is called “The Pond – Moonlight” and was taken in Mamaronek, NY. It was sold for $2.6 million in 2006. Steichen is a personal favourite of mine. He lived a long creative life and moved through a series of techniques and genres. Founder member of the pictorialist school of the photo-secession, then fashion photographer, war photographer, museum curator – a real polymath. None of these photographers have used particularly sophisticated kit, and yet….